Hi there my fellow cardmakers & crafters. I know it has been a while since I posted. The summer kept our home full. We had a lot of family come for visits. 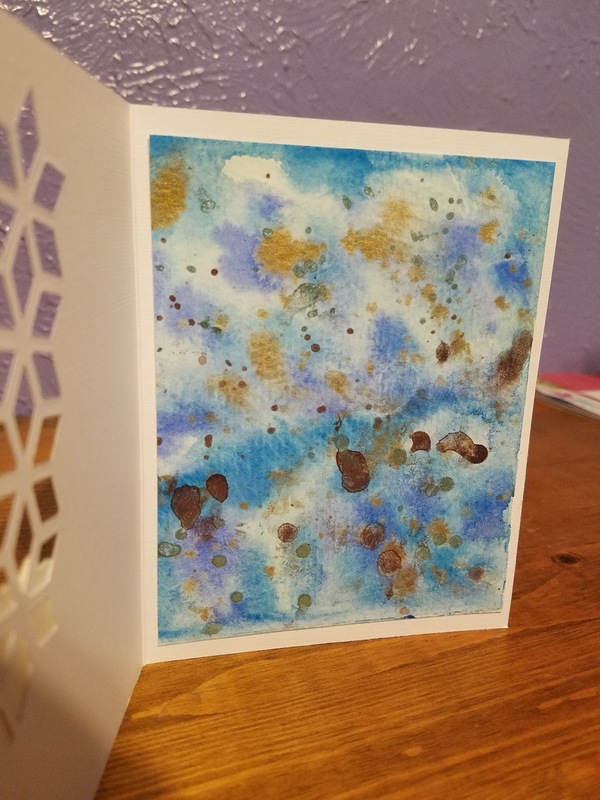 For my card I used my Kuretake watercolor paint set. Once I got started with this first card, the mojo kept flowing until I had made 3 more! It is very fun. I liberally wet a piece of watercolor paper with my paintbrush. Then I chose my color combo. For this card I used 3 shades of blue and a little pink that mixed with the blue, gave me a light purple. Which I loved! Then everything was completely dry I spattered my Perfect Pearls Forever Green, Mint, Forever Violet, and a little bit of Gold. I loaded up my brush with wet paint. Then I tapped the paint brush on my finger and spattered the metalics. Let your piece dry completely while you work on the other elements of your card. I really do LOVE this technique. Using Whisper White cs and one of the dies from the Eclectic Layers Thinlits from Stampin' Up!, I cut the pattern for my window. I used Nuvo Crushed Grapes Crystal Drops on the four corners. 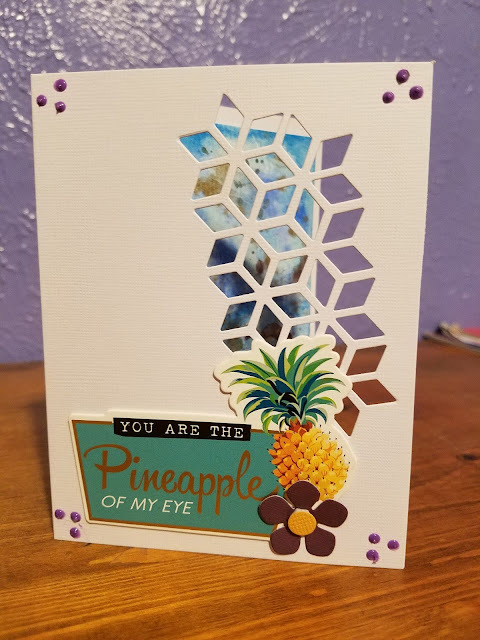 I used a stick for my sentiment and I die cut a little purple flower with a yellow dot for the center to accent my card.